Your dashboard exists to communicate information between you and your car. It helps you remain aware of how fast you’re going, how much fuel you have in your tank and whether or not there are any critical problems with the engine. It also displays a number of warning lights, and if you learn to read these lights correctly, you will have a better idea about how to properly take care of your car. The seat belt reminder is one of the more common dashboard lights. It looks like a small human figure with a seat belt across the chest, and it appears anytime you forget to put on your seat belt. It’s a good idea to get in the habit of always putting your seat belt on as soon as you get in the car. In most states, you could be ticketed for not wearing one. The low-fuel notifier usually appears as a small gas pump with a line across the front. It appears when your fuel tank is running very low. Not all cars have a low-fuel notifier light, so always keep an eye on your gas tank. This light appears as a triangle with an exclamation point inside of it, and it signals an unidentified problem with your engine. When you see it, you should take your car to the shop for a diagnosis. A circle with an exclamation point inside indicates a problem with the brake system. Always get this checked out right away, even if it feels like the brakes are functioning correctly. A human figure, strapped into a seat with a large circle out to the front or the side indicates that there may be a problem with the airbag system of the car. If you see either of these lights, have the car checked out right away. You don’t want an airbag to accidentally deploy while you’re driving. A small rectangular box with a plus on one side and a minus on the other is the battery indicator. If you see this while driving, the battery may not be properly charging. A curving rectangle with three arrows coming up from the bottom is your front windshield defroster light. A regular rectangle with the same arrows indicates the rear defroster. A top view of a car with the two front doors open indicates that one or more of your doors may not be closed properly. Hopefully, if you have been driving for a little while, you are familiar with the turn signals. These lights should begin blinking as soon as you activate your turn-signal lever. If you ever notice that one or more of your turn signal dashboard lights are blinking much faster than normal, one of your headlights is burnt out. A small fuel can with a drip coming from it indicates a problem with your oil pressure system. If you see this light, you should stop driving immediately. Driving while experiencing problems with oil pressure could potentially ruin your engine. If you see what looks like a small thermometer floating on the sea, your car may be overheating. Always keep an eye on the temperature of your engine. 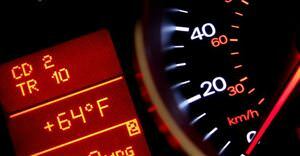 If your engine is running hot for a long period of time, there may be a problem with your coolant levels.